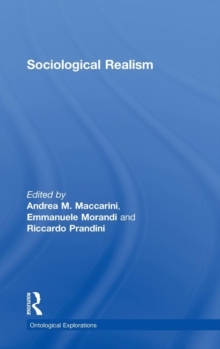 Sociological Realism presents a clear and updated discussion of the main tenets and issues of social theory, written by some of the top scholars within the critical realist and relational approach. It connects such approaches systematically to other strands of thought that are central in contemporary sociology, like systems theory and rational choice theory. Divided into three parts, social ontology, sociological theory, and methodology, each part includes a systematic presentation, a comment, and a wider discussion by the editors, thereby taking on the form of a dialogue among experts. This book is a uniquely blended and consistent conversation showing the convergence of European social theory on a critical realist and relational way of thinking. This volume is extremely important both for teaching purposes and for all those scholars who wish to get a fresh perspective on some deep dynamics of contemporary sociology.